Professor Jacobs is Professor, Presidential Scholar, and Chair of Philosophy at John Jay College, City University of New York. He is a Visiting Professor of Philosophy at CUHK from 1-20 May 2015. Professor Lizza is Professor of Philosophy at Kutztown University of Pennsylvania. He is a Visiting Professor of Philosophy at CUHK for the Second Term, 2015-16. 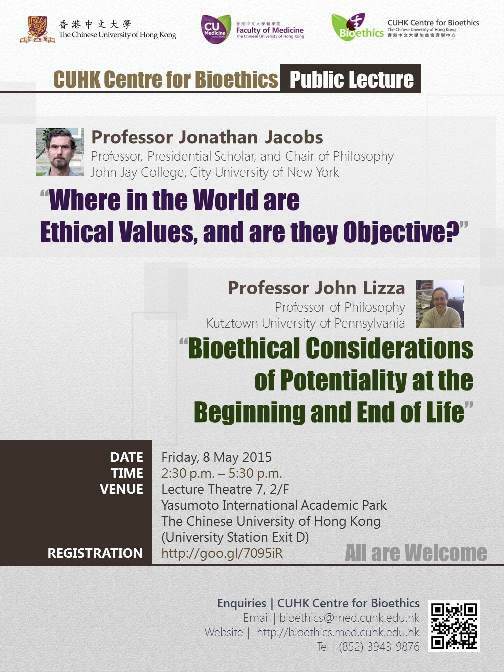 Presentation slides by Prof. John Lizza: "Bioethical Considerations at the Beginning and End of Life"
Presentation slides by Dr. Cansu Canca: "Potentiality: Response to Professor John Lizza"